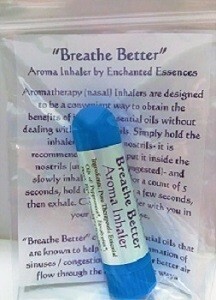 Essential Oil Aromatherapy Inhaler. Unscrew the cap of the tube and inhale the aroma through the nose. Use to help de-congest a stuffy nose. Due to the Safety Precautions for Eucalyptus globulus and Peppermint Essential Oils (according to Robert Tisserand's Essential Oil Safety Book), this product is not recommended for children under 10 yrs. old.